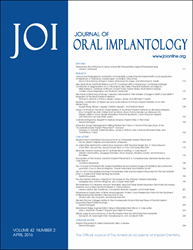 An article in the current issue of the Journal of Oral Implantology explains how a newer type of xenograft can help improve the existing soft tissue support in dental implants. Porcine collagen xenograft, which had been tested with natural teeth in previous studies, was evaluated with dental implants and was found to provide adequate support. Journal of Oral Implantology – Dental implants are usually needed when teeth are lost because of gum disease or injury to the soft tissues that support and protect the teeth. These same problems can affect the soft tissue that protects dental implants. These clinical soft tissue issues can make it a challenge to place fixed dentures or crowns. An article in the current issue of the Journal of Oral Implantology explains how a newer type of xenograft can help improve the existing soft tissue support for existing dental implants. A stent helps the oral surgeon properly place a soft tissue graft that ensures the soft tissue stays in its desired position during the first few days of healing. It’s best to augment soft tissue before placing dental implants, but this is not always possible. The oral surgeon may discover after the implant surgery that additional soft tissue is required. Several types of soft tissue grafts made of tissue from humans or another species, such as domestic pig, can be used. The author of this article used a porcine collagen xenograft to augment the existing soft tissue. Other researchers have studied the collagen xenograft and found it to be as effective as other graft materials. However, previous studies typically used porcine collagen xenograft with natural teeth, not dental implants. The current article outlines the process used to augment the gingival soft tissue of 11 patients who had fixed partial dentures or splinted crowns. All patients underwent the same procedure. The surgeon removed the stents five to seven days post-surgery and checked for healing. In the subsequent four to twelve weeks, the surgeon evaluated how well the soft tissue had healed. In all cases, the surgeon controlled bleeding early-on to avoid the collection of blood under the stent. The author placed the xenograft to cover the surgical wound, and then strategically placed a stent made of a bis-acryl material and quickly shaped the material before it hardened. The author noted the importance of using a piece of collagen that is 8 to 10 mm wide and as long as needed to fill the surgical wound. Narrower collagen pieces did not create enough supporting tissue for the implants. All patients healed uneventfully. However, the new soft tissue was not the thick, protective type of keratinized tissue that typically surrounds teeth. Instead, it appeared to be an immobile form of a softer, elastic tissue similar to that lining the floor of the mouth and cheeks. Not withstanding this variation, the new tissue created protection for the dental implants from distortion that is frequently caused by the pull of facial muscles. Full text of the article, “Stented Porcine Collagen Matrix to Treat Inadequate Facial Attached Tissue of Dental Implant Supported Fixed Partial Dentures,” Journal of Oral Implantology, Vol. 42, No. 2, 2016, is now available at: http://www.joionline.org/doi/full/10.1563/aaid-joi-D-15-00050.